Congratulations to the 2017 Paul Harris Fellows honored by the Rotary Club of Enfield at a June 9th banquet. 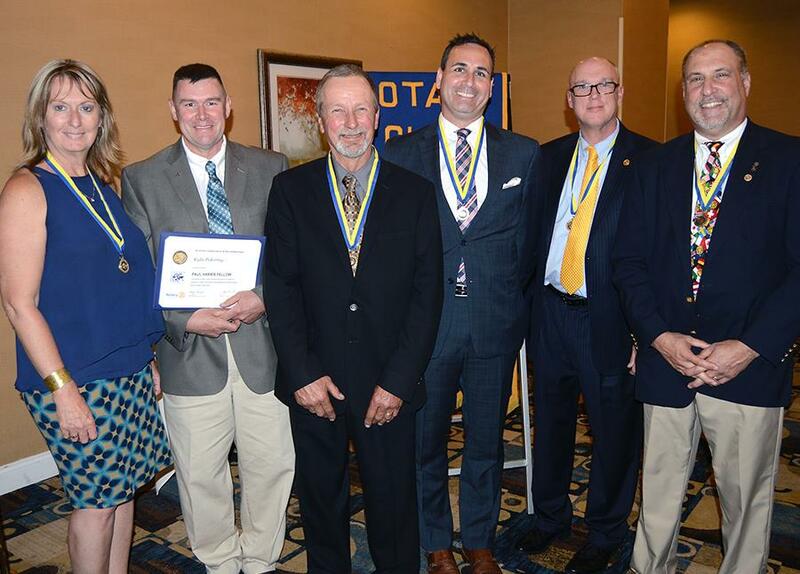 They are (l-r) Enfield Rotarian Mary Arcouette; Bill Pokorny, who accepted a posthumous fellowship on behalf of his late daughter, Kyla Pokorny; Gary Raffia, a local businessman who has been raising money for the CT Children’s Medical Center for decades; and Charles Miller, owner of Miller Farms Family Market - ShopRite in Enfield. They are joined by Kevin Mayo, Enfield Rotary Club President; and Ed Palomba, the club’s Rotary Foundation Chairman. Each recipient has gone above and beyond in providing services, supporting their communities and rallying others to contribute to worthy causes. The impact of their actions has been felt by thousands of individuals. The Enfield Rotary Club meets at noon on Wednesdays at the Holiday Inn of Enfield-Springfield. Visitors are always welcome. For more information about the Rotary Club of Enfield, please visit www.enfieldctrotary.org. For more information about Rotary International, see www.rotary.org.